When I mentioned I was going to read The Duggars: 20 and Counting! a person said that they hoped I wouldn't be too influenced by the Duggars and I had to chuckle for a couple of reasons. #1 - If you read a book, you will be influenced by it in some form or fashion. To assume otherwise is to fool yourself. #2 - I personally agree with the Duggars in faith and family. Now, reading their book is not going to make me want to personally birth that many children. I'm barely making it through another pregnancy! But I like large families. They are (typically) fun. I should back up a ways and tell you that I first read Jon & Kate's Gosselins book, Multiple Bles8ings way back before I ever realized that they were on tv. (We don't have cable so I'm usually slow to hear about new shows.) I read their book at the same time Lauren was reading about the Duggars and I discovered that they also had a show on TLC. I started watching a few episodes of Jon & Kate Plus 8 and then regretted reading and reviewing their book. (My review is no longer online.) I only recently watched a few episodes of The Duggars and I wanted to read their book more than ever! Why? Because they actually practice what they preach. When they say that they value their children and find them to be a blessing, they mean it. Not to bash Jon and Kate or pit the two televised families against each other, but as a mom looking to be encouraged in both pregnancy and child rearing, in my mind there was an obvious choice of who to be both influenced and inspired by. I wrote up a post about how Michelle Duggar has inspired me in motherhood. Her quiet spirit in the midst of a crowd is something I admire. 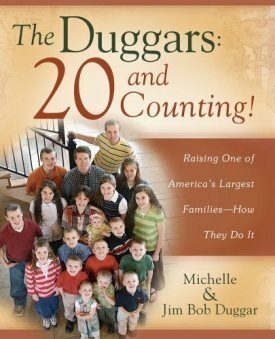 I enjoyed reading The Duggars: 20 and Counting! to hear more "behind-the-scenes" stories of their family. Several things are alluded to on their television series, but the specifics are in the book. Things like: Michelle and Jim Bob's growing up experiences and backgrounds, the particulars of when they met and the prayers they prayed, how they came to value debt-free living and how their family moved from a 900 square foot home to their current place of residence. In this book they answer several e-mailed questions asked by viewers of their show and they have their children answer a great many of said questions. They paint a picture of a typical day in the life of a Duggar Family and do explain how they attempt to organize their life - and enjoy it - with so many people. In a day and age when having children is extremely undervalued (to the point of killing them via abortions) the Duggars are a breath of fresh air. They are genuine, real, devoted Christians who believe that God is in control and who has seen fit to bless them with a large family. Of course there are people who do not like their message. (That is not surprising.) The Duggars are counter-cultural. They aren't going to win any popularity contests. Instead, people resent them their children and make fun of them for their beliefs, appearances and practices. Perhaps you are also one to speculate against them. I would just say to that - check into this family. Because everything I have seen both on their show, read about in the news, and now have witnessed through this book is that they are a genuine group of people to be encouraged and, yes, even influenced by. At the very least, I believe even the nay-sayers are forced to respect them for their consistency in message and behavior which is much to be admired. It is certainly more than most "celebrities" can boast in these days. I, for one, really like and admire their family and yes, I can see lots of ways that I would like to learn to emulate them. For now, God has given us three little blessings which we are called to serve and to raise. Three or twenty - the responsibility is the same: to love, to serve, to sacrifice as parents - for the love of our children and for the glory of God. Valuing life. Valuing children. Valuing family. All the while putting God first. Yep, I can learn something. Amen!!! Now while I refuse to have 19 children or more, I do have four beautiful children. Each do have their own unique features, personalities, etc. Which is why we ended up with number four. We were still curious what our next child would look like if we had another one. We are now really done. It is hard work raising these ones, don't know how the Duggars do it. Obviously I need to put this book on my growing reading list. The Duggars sound like people of integrity -- in circumstances that surely test it. I hadn't heard of them before these posts of yours. I'm just starting the chapter on stem cell research in George Bush's book. We so need to defend the defenseless. We had a family in our former church who had 13 -- I think maybe they've had another since then. They didn't seem frenzied and all their kids seemed gracious and well-adjusted. I wish I'd thought to ask her to speak about home management -- I'm sure she could have taught many of us a few things! Personally I've never felt led to have that many (obviously) -- at times I felt like I was drowning with just three, and I wonder how they ever manage one on one time with that many. But I think when God gives that many, especially to those who have children for Him, He gives them the grace to handle all that is involved. I haven't watched much of either show, but Kate seemed to have such a negative attitude in general. I am glad the Duggars' attitude is different. I'm near my limit. (Not there yet, but definitely close.) I need to not to be pregnant to determine that. ;) But 19 is definitely not in our picture! Still, when I see families who enjoy having a lot of children and who really work on making sure that their children are set up well to be friends with one another - *and in a correct manner* - I love it! Okay, so I know I am going to start sounding like the president of the Duggar fan club with all my comments about how much I admire their family! I get frustrated with the critics of this family--particularly those who say the Duggar family places a strain on natural resources, overpopulation, etc..., The Duggars are such GIVERS. If the rest of us could get our 1-4 children to behave and contribute in the same way that the Duggar children do, wouldn't our world be a wonderful place to live? I am so inspired by this family. 19 Kids and Counting is the one show that I make sure to watch each week! I have read this book too and it seems the Duggars dont seem to have a single thought of their own. They follow this guy named Bill Gothard who borders on a cult leader. Google him for more info. Given how they changed over the years, it is obvious some of their beliefs dont set well with the public. If they value life so much why not help those who suffer in war torn countries and poverty. Im pro life but to me that means all life. For you wondering how they handle so many kids, simple their oldest daughters do most of the work. Chores are one thing but not a full time free nanny.Lauren if you only knew why the children behaved. look up blanket training. They are raised to obey with no question which is unrealistic what kid doesnt question. On the outside you see happy faces but who knows what goes on in the kids heads. I almost fell for the happy go lucky family until I read up on their beliefs. BTW George Bush is considered the worst president in history. The Republicans wanted back in the senate to extend his tax cuts for the rich. I'm always curious to see what different people think of the Duggars. I've never watched their show, but I did read this book--and have been on their website on various occasions. I have mixed feelings about the family--but not as much because of the family themselves as because of the teacher they so admire. I attended Bill Gothard's Basic and Advanced Life Seminars as a teen. While there were some good things to be learned from Gothard, what stuck with me most was the works mentality intrinsic in his teaching. Gothard's injunctions go beyond avoiding debt and not using birth control--they also include not mixing milk and meat, not listening to music with syncopation, and not engaging in marital relationships until a week after a woman's monthly flux. While I rejected some of Gothard's teachings out of hand as being Biblically suspect (for example, the music with syncopation part), I still spent much of my teenage years trying to live up to the law in order to gain favor with God. So, I guess the Duggars have a somewhat unhappy association in my mind with the legalism I labored under during my teenage years (that God was gracious enough to bring me out of) and one of the teachers who kept me under that heavy yoke. Perhaps I'm just rambling by now--but I felt like sharing my own (perhaps unique?) perspective on the Duggars. Oooh...I would like to point out that I am very familiar with Gothard & ATI. Quite. I think as Bekahcube pointed out (as I could say is the case with *any* ministry) there are things to take and things to toss. I most *definitely* do not agree with everything that Gothard espouses but I do think there are grains of truth. And I can think of a great many personal friends who have at some point or another been a part of the organization and are very solid, admirable characters. I think anyone who takes an honest look at the the Duggars will be forced to note the frequency in which they state that they have some "personal convictions" about particular matters that they do not impose or make demands on those around them. If they were super duper strict, they'd cloister themselves away from a lot of the people that we see them spending time with on their show. Which they do not. And FYI - they have gone to third world countries to care for the needs of others. Which is far more than many Americans, including myself!, could say. Normally I don't bother responding to Anonymous commenters - especially those who clearly have a bone to pick but won't sign their name to their comments. However, I did want to clarify a few points without shouting out names of presidents I may or may not like. It should be noted though that I have "a thing" about addressing folks who only pop their head up to blow off some hot air and raise a ruckus anonymously, only to stir up trouble. I don't meant to stir up trouble here, as that is clearly not the point of this post. Nor of my comments. I will close and shut down comments on this post if we can't speak nicely to one another and cannot use our real identity in addressing issues when we think we have some. That is always my policy on this site and will continue to be so. We use real names if we want to dialogue and we speak respectfully to one another. If you post as anon, I'll assume you do not really wish to communicate but instead just feel the need to rant. Which is not your right here at Reading to Know and something I will monitor. I am very open to kind dialoguing (Bekahcube gives us a fine example of sharing a difference of opinion) and that's the way this boat floats. K? Here's a comment from today's Juggle blog on the Wall Street Journal. I wonder how many children from large families would agree that they've already "been there, done that" in terms of parenting young children. I grew up in a family with 5 kids and I was the oldest. I hated having to share a room with a sister who went to bed early, not having money for the extras like ski club and trips to Florida, having to babysit all the time after school and the overall chaos of a large family with many similltaneous events going on. I was always jealous of my friends who had their own rooms and one or two siblings. I think my homework suffered from the lack of privacy and quiet. I missed having the attention from my parents too, they always seems distracted and busy. I am sure some parents can handle it, particularly if they have enough money and a nanny for the little ones. For me, it was a pain. That’s probably why I didn’t have any kids. I feel like I have been there already. I have probably changed more diapers and fed more kids than most mothers that I know. My husband is also the oldest in a family of five kids - and LOVED it! His parents were involved in his life, he had siblings to play with and it was a great experience. And they did not have much money when he was growing up. They just learned how to use what they had very well. When we got married and had our first child, I, coming from a family of 2, was worried I wouldn't know what to do. My husband was totally confident, which I appreciated. He had the experience, as you say, and it made ME confident. Coming from a family of 2 siblings, I always envied those with more children to play with. So...I think as you say, the parents can set the environment. Some do it really well. And unfortunately some do not. I would just be cautious in saying that just because not all do it well it should never be done. Obviously, some families are quite successful at it and the children are very content and happy in the situation. I would NEVER say it should never be done. I just get frustrated with people who claim that one way of being Christian (i.e. have a large family with stay-at-home mom) is the right one. God creates many different types of people and we are ALL parts of the body of Christ. I'm the oldest of a family of 4 and enjoyed it too, but as you point out, many people want something different from what they grew up with. Some things are different than when I was young financially. Housing is more expensive due to increased population (more people competing for housing in urban areas) and environmental laws. Medical care is far more expensive and less is covered by insurance. (Pulmicort, a daily asthma medication, runs $300-$400/month) More severely disabled babies survive, so more families have 5-6 digit annual medical bills and corporate medical insurance covers them, but this means higher medical costs for everyone AND thousands of dollars in out-of-pocket costs for those families. I hear too many people step out in faith and then, when they are hit with the statistically likely disability or even death, act shocked that it could happen. Christians are subject to the same statistics as everyone else. I think the important thing is to realize that there's a gracious middle ground. You can't rightly claim that the only way to be a good Christian is to have a large family (btw, the Duggars do not do that) nor should we be jumping to the opposite extreme saying that we SHOULD have smaller families. As at least one Taia said - God made us each differently. I do not intend to have 19 children. I obviously did not intend to have 2. But I wouldn't base my faith on my numbers. And I disagree with anyone who would. I think lots of times the truth hurts. Saying bigger families are happier is an insult to others. Bigger families aren't necessarily happier. If you cant feed and clothe that many kids properly you shouldn't have them. Sorry thats how I feel. For some reason Quiverful thinks G-d loves them more because they are making all these sacrifices financially and kids are' rewards'. Kids are the ones who emotionally and financially make the sacrifices. they did not choose this life the parents did. Even families of four or less can struggle. A real buddy system wouldn't be bad but those girls seem to do most of the childcare. One said childcare wasn't Jim bobs jurisdiction. Heck, he is responsible for bringing them into the world. That just disturbed me. What bothers me is that Michelle hardly ever spends time with any of the other children except for Josie, and tells the older girls to do things that SHE should be doing. I guess anyone could have 19 kids if I pawned all my children on each other. Saw this and HAD to comment just...cause. I have a post on the Duggars too. It's confusing because it's entitled "Let's All Hate the Duggars." But that is meant to be ironic. I LOVE them! There are problems I have with Bill Gothard, but I don't understand why someone's personal choice seems to be an affront to others. They love kids, so they had a TON, great job for them! Why are people threatened by that? I also have a friend, correction...I know a girl from a big family who also talks about how put upon she was. Her sister on the other hand, LOVED every minute of it. I think it really depends on the kid. I think if you are worried about ski club and Florida trips and aren't reveling in the joy of having so many fun brothers and sisters, maaaybe you are just a selfish little brat who needs to grow up. Hahaha...you can tell this is totally not personal. Nope...no way.